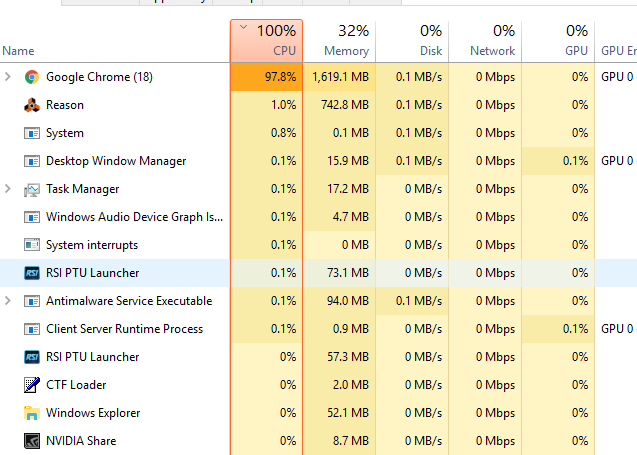 I'm having issues with the Reason Talk home page causing 100% CPU usage. It's happening to me in both Chrome and Microsoft Edge on Windows 10. I even fired up Linux in a virtual machine and tested Firefox, and it gave me the same 100% usage result. The actual forum seems fine though. Could be a bad advertisement or even a compromised server. Please investigate. I have a good feeling about what the cause of this is, and I can say that besides the CPU usage, there's nothing harmful going on. I'm investigating it right now and will return with a status. Problem has been found and resolved. I'm still hitting 100%. I tried clearing my browser data. Perhaps it's still cached somewhere else? Usage issue seems good today.